Long Beach, CA – February 7, 2018 – Mercury Security, a global leader in OEM access control hardware and part of HID Global, today announced its powerful new family of MR Series 3 Serial Input/Output (SIO) modules that extend integration capabilities, enhance cyber security and provide seamless upgrades for existing Mercury-based deployments. The next-generation SIO modules are built on the Authentic Mercury open platform and provide OEMs, channel partners and end customers the flexibility to choose the controller configuration that best fits their needs. The modules introduce a new level in cyber security with an embedded crypto memory chip that provides a secured layer of encryption to onboard sensitive data. They also support OSDP and Secure Channel Protocol for enhanced connectivity, device management and extended applications such as biometric-focused applications. In addition, support for the federal government profile (FICAM) makes it possible to expand the controller architecture and streamline the implementation of government systems. Lastly, partners and end customers can benefit from the modules in new access control systems or they can be used for seamless plug-and-play upgrades from Mercury’s existing MR series controllers. The product family includes four serial SIO modules that enable system expansion of Authentic Mercury intelligent controllers as part of Mercury’s distributed architecture. 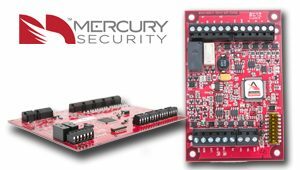 The MR Series 3 Serial (SIO) modules feature Mercury’s new “red board” design and are available through the Mercury partner network. Click here for more product information. Mercury Security (www.mercury-security.com) is the global leader in the supply of OEM access control hardware with the largest installed base of over three million panels sold. With over 25 years in the market, Mercury provides open platform hardware that addresses the full spectrum of access control requirements. This ensures OEM partners, installers and end customers spanning virtually all vertical markets can select from a variety of Authentic Mercury solutions to meet their needs.